What are the alternatives to bi-fold doors? 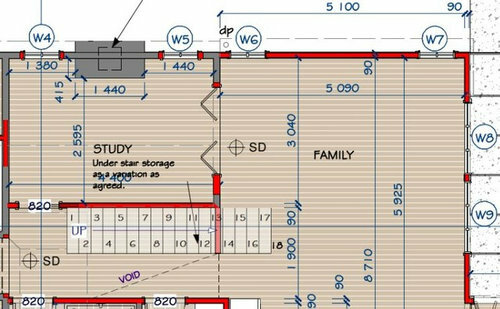 So...as part of my renovation I am including a study/library which is adjacent to the Family/Living room as shown in the plans attached. The idea we have worked with here is to allow the study to effectively be part of the family area, which can be closed off using bi-folds for privacy if required. My issue here are the bi-folds. When opened...which could be most of the time, they will effectively sit right in front of W5. This will prevent me from using that corner effectively...it might be nice to put a reading chair there (facing into the room)...or possibly a small desk (facing the window). My question then...what alternatives do we have for the doors if we DON'T use bi-folds? We need something which is both functional and beautiful. Im not sure I have seen the type of bi-folds you are referring to. Might you have a link or a picture?? I will have a look around tonight. they seem to be popular overseas. I can't imagine why they wouldn't have them here. one would think that internal bifolds doors open outwards or inwards depending on which room is considered to be the "in" or "out" room and the way the doors are installed? Knackers, I think that your looking at bifolds to an outdoor area, these bifolds will be between two internal rooms. Hi some great ideas here, something from left field - please have a separate toilet somewhere but not in the bathroom! Sick children needing the toilet whist someone is bathing, teeth cleaning after a 'big job' has been done, phew! Waiting for a shower is ok but if you have to go, you have to go! Wow...Samie...that is very left field. I dont have room for a toilet on its own...but we have a toilet in the en-suite...and only one child. I doubt that both bathrooms will be full and in use if we were to have a sick child. Its a good idea....if I had the room. I just had a look at your photos and even though the study being the original part of the house with taller ceilings and the family in the new with lower ceilings, with both these rooms opening to each other shouldn't the bottom of the windows line up? Hmmm. Good point. I will check the plans and with the builder. I have just checked with the builder regarding the alignment of the windows. Basically what he has indicated is that the roof height in the study (original part of the house) is higher that the family room and the windows have been adjusted accordingly so that they are the same head height. The bi-fold doors will be put in place as designed. 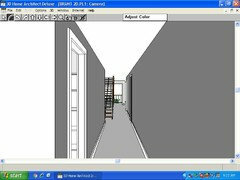 I discussed with the builder the possibility of moving the stairs across the corridor and opening up the study, but then we would face loading issues with the loft wall sitting directly on the study wall below. I still very much believe the study is a of a good size for the function it will provide and over the weekend, went to music classes with my daughter and can see that a piano will happily fit in the space and look very beautiful. I don't thin we are losing anything here. As was mentioned in an earlier post...the original issue with me was the bi-folds opening into the study and disabling my ability to put a chair in place. Really the issue is about a single chair!! I think I can learn to live with a different furniture placement. The chair isn't a big issue, the windows are, I think what your builder is suggesting is wrong, have you spoken to your designer. Paul it's hard to get the real picture by a couple of photos, but in this case I would rather see the windows aligned internally and not how they appear from the outside, What would you suggest in this situation.The wall opening between the Living and study is no longer full width, so I think it would be best to have any bifold doors pull back to wards the staircase within the study? I have discussed everything with my designer and we are staying with the study and bi-folds as they are. Unfortunately given the sizing of the property overall, the space, the loft and where it needed to be and the fact that we are governed by a heritage overlay our options for movement and arrangement of rooms are very limited. The positioning of the windows may be a different issue...but overall we don't have many (any) options to move things about. I suppose I really need to be happy that I have an inner city property and some capacity to renovate. I don't know if you plan on an open staircase which I love, hope this helps. LOLOLOL. I think your projection is AWESOME! I see what you mean about the windows. I have added an elevation diagram below which shows that the new part of the house has an internal height of 2665mm. The old part of the house has a height of 3330mm. If we did adjust the windows I think we would have to lower W4 and 5. I really dont know how I will test the options....but I will take a look and see. It would have been lovely for windows 4 &5 to be dropped with highlight windows above perhaps, Paul might have another suggestion. Sorry I've missed most of the conversation and salient details but if it was me and an old house I would put in steel framed glass with a set of French doors in middle. Would really keep it as two rooms though. Thank you again for these mock-ups. Definitely some good ideas. As you would have seen from my photos the windows we selected are in place already. I dont know what might be involved in replacing those and ordering new ones. I have to say, I didnt like the idea of the French doors. the just didnt match the sort of style we were looking at. Im still not sure, but as I look at them more and more they do grow on me. I will need to look at a few more styles and add these to the maybe pile. Brant, I would keep the two individual windows. They blend into the renovation of your home. Installing a high set long window, in my opinion would not look as good. And you do have space between windows for a TV already. And there is no rule against putting side tables or chairs in front of windows. The study will be visually separated once bifold doors are installed so the different height in the windows will not stand out, in my opinion. With looking at the window heights. Do the windows in family room, line up to the top of windows/doors that face out to the alfresco area? If they do then I would keep as installed. They do, that's why the high window was a suggestion to Brant, which would give him light/ privacy/more space as this is the only solid wall in the living room, the neighbours are also close up on that side. All the windows in the old (original) part of the house align...and all the windows in the new part of the house align. There is no alignment between the old and the new. Hi Brant, that is good. Therefore I don't see an issue with your windows as installed. Brant, this looks wonderful. These photos show, that once your bifolds are installed the study becomes its own room. The height of windows in family will relate to the others in the family room, not the study. All the best. The open stair looks better on the mock up. Only concern from a safety aspect is your young child using the open stairs. But, children do grow very fast. 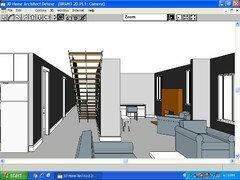 Good to see your designers 3d images, as per my 3d, I prefer the open staircase to open up the space. I completely agree with siriuskey re the fridge...it's one of my pet peeves, in an otherwise well finished house it just cheapens the whole look. I am a bit aghast! I cant thank people on this forum enough for the ideas and thinking. Its a lot more than I had expected. Truth be told...I LOVED the open stairs the minute I saw the mockup from @SiriusKey! I loved them even more when my designer did his mockup...He also loved them and my wife loved them. @ Paul Di Stefano Design ...I love your response and the certainty with which you wrote it! I think I would be nuts to go in any other direction. My only concern is cost!!! How much more is this going to cost me. In any case, what particular detailing or attention do you think we need to look at here? Sorry to throw more spanners in tbe works because I don't know what is upstairs but did you never consider running stairs up from living room instead (not where you want bifolds but completely reversed from where they are now)? I imagine all too late now but tnat would have made it easier to manage the under stair area from the study. Just revive the thinking on your stairs, they do take up a lot of passage and study space, cramping it. 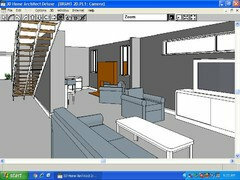 My CAD program is a lot older than your designers but it was top end, I don't charge as your designer would for his time so I hope my furniture and colours don't put you off. Once again I would still like you to re think your stairs, this deals with the bi fold doors (why are they glass) and the anomaly of the windows. 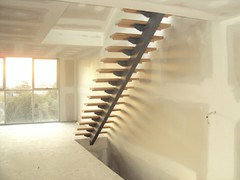 The stairs could easily go along either family room wall with a small return into the man cave. TV on wall with a pivoting bracket for kitchen viewing, with perhaps an IT student desk for parental supervision under the open stairs. The bi fold doors could be used on the passage wall of the study, they could have a support post between both sets? Stairs, (like I've said repeatedly on this forum), should be the FIRST thing resolved at sketch design stage. I dont mind the spanners to be fair...gives me more things to think about. So upstairs is my loft area which I will use as my office/man-cave. 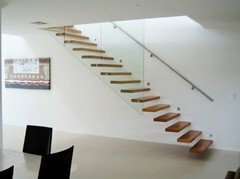 We did give a lot of consideration to the position of the stairs and really couldn't find a better place to put them. 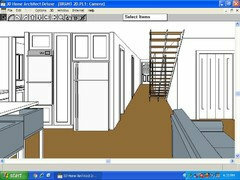 We were very restricted by the heritage overlay, the position of the loft and the loading this would cause downstairs. Also...as I've mentioned, while our study area will get a lot of use, the Family room is a more general space that will see a lot of traffic...especially being an open area with the kitchen. So moving the stairs into that area would reduce the function of the that space which really isnt desirable. I think we have reached the best possible compromise for where it is. If we had more room...I could do more...but I just dont. With the study as it is, I can open the doors and make it a part of the family room...or close the door when privacy is required for music playing, reading, study, yoga...whatever. With the study as it is, I can open the doors and make it a part of the family room...or close the door when privacy is required for music playing, reading, study, yoga...whatever. I don't charge as your designer would for his time so I hope my furniture and colours don't put you off. Firstly I have to tell you...noting you have drawn or suggested has put me off...in fact quite the opposite. I would not have considered an open stair case without seeing your 3D projection. We now WILL head down this direction. So kudos to you for helping me think on this. Just revive the thinking on your stairs, they do take up a lot of passage and study space, cramping it. As much as I might like to move the stairs, I am somewhat restricted for various reasons I have mentioned. I honestly dont think they take up a bunch of room and I think where they are postioned maximses the family spaces. 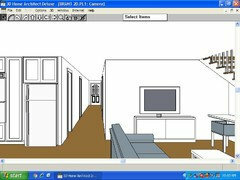 Just looking at your own 3D model for the position of the front door it all looks great. Nothing at all wrong with your program or your diagrams. They really helped us with a positive direction which our own designer didnt come up with and now agrees with. Once again I would still like you to re think your stairs, this deals with the bi fold doors (why are they glass) and the anomaly of the windows. 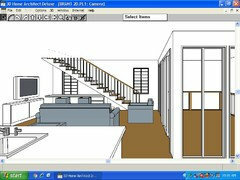 I really cant do a lot with the stairs or the position of the wall in the corridor for the study. There are a number of considerations around loading which I cant easily combat. 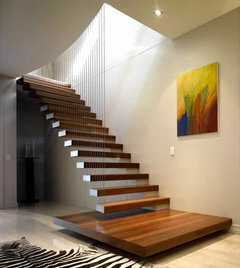 Making the staircase open I think really adds a lot of dimension to the space and actually makes it work. We haven't decided on what the bi-folds will look like. My wife happens to like the glass...but we haven't made any solid decisions. Thank you for your pictures and continued ideas. So much good stuff to think about. Now that we have decided to head down the path of an open staircase we need to decide what this should look like. I realise that this is a modern architectural element we are introducing into an Edwardian/federation house...so I want whatever we put in place to be somewhat sympathetic to the house. Thanks Brant it's always good to receive some positive feed back. Sometimes it can be difficult not to offend someones ideas, I always have a need to speak the truth and I would never say that I like something if I don't, like the window issue, it will not be OK, you can try to cover things up but it never resolves the issue. Apart from that if I said something was OK to make you or anyone feel better, and then you build it and hate it what sort of an idiot would you think I am. 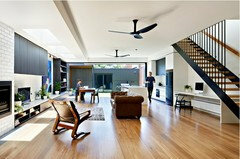 This link takes you to a Melbourne Architecture firm who I think has some great ideas and marry the old with the new. 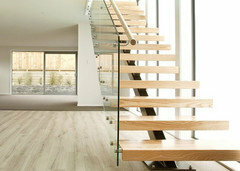 I do like their simply staircase and for practical reasons as well by having hand grabs on both sides. Bathroom door - sliding, bi-fold or swinging?? Stacking or sliding exterior doors? What do you think about hexagonal bathroom tiles?